What goes into an Italian dish? Garlic: Garlic's characteristic flavors add depth to Italian dishes. It has antibiotic, anti-fungal and anti-cancer characteristics. It is also heart-healthy and prevents clotting. These health benefits are due to the sulfides present in garlic. The sulfides are released when garlic is crushed, chopped or let to sit for 10-15 minutes before cooking. Olives: Olives are used in almost every other dish in this cuisine. They are known to lower blood cholesterol, LDL cholesterol and LDL: HDL ratio which in turn helps to lowers the risk of heart disease. They also have anti-cancer, antioxidant and anti-inflammatory properties. Basil: It is a herb used to flavor sauces, salads, pasta and pizza. It is a good source of vitamin A and prevents clogging of the arteries, thus preventing heart diseases. It also has anti-bacterial and anti-inflammatory benefits. Balsamic vinegar: It is a sweet- tasting vinegar used in sauces, salads and marinades. It helps to improve body's functioning and has few weight loss abilities. The vinegar boosts the activity of certain digestive enzymes and increases insulin sensitivity. However, it could cause throat irritation, dental erosions and lead poisoning also in some people. Cheese: Italian cuisine uses different types of cheeses like gorgonzola, parmesan, mozzarella and ricotta. These cheeses are rich in protein and calcium, although, excessive use can affect the heart due to the saturated fat present in them. 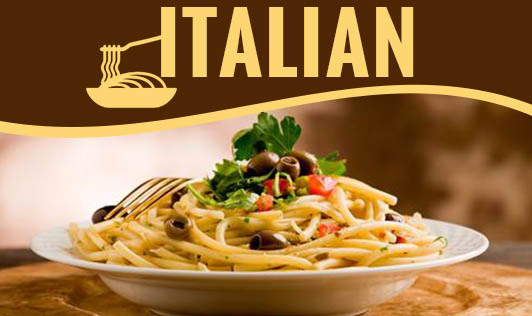 Authentic Italian cuisine is one of the healthiest cuisines in the world. It uses fresh fruits and vegetables, whole grains, beans, herbs and different types of cheese. It is a balanced meal with all the food groups and nutrients included. It is a heart-healthy cuisine as it uses ingredients like olive, garlic, olive oil and different herbs. The cuisine provides good amounts of calcium from the different cheeses used. The metabolism increases due to the use of whole grains, fresh vegetables and tomatoes. The fibre content of most of the meals is high since the use of herbs, leafy vegetables and whole grains are high. A good amount of protein is obtained from the beans, cheese and seafood. The use of fresh fruits and vegetables provide different vitamins and minerals required. However, excessive use of cheese can cause heart diseases, since it is high in fat. This can be prevented by using low-fat cheese in small quantities. Including a variety of vegetables can increase the nutrient density and add variety to the dish. The pasta and pizza dough should be prepared using whole grains to increase the fibre content and reduce the refined flour intake.